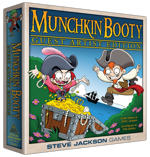 August is all about the booty - collecting it in merchant ships, stealing it in pirate ships, or saving it by getting lots of hard-to-find promos in one Munchkin booster! Check out these new offerings coming to your store this August. I'm going to have to ask you to come in on Saturday, okay? Thanks! 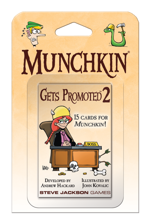 Sorry, you won't get a promotion just for buying Munchkin Gets Promoted 2. But you will get 15 Munchkin promo cards – out-of-print Doors and Treasures that you'd have to hunt down one by one if you hadn't bought this booster. You know that's better than a nominal raise and a stricter dress code. This sequel to the popular Munchkin Gets Promoted is an expansion for Munchkin. It is not a stand-alone game. This is NOT a collectible or randomized set. Every Munchkin Gets Promoted 2 pack is the same as every other. Celebrate 15 years o' Munchkin with special Guest Artist Editions! Sail the seven seas. Taunt your foes with your awful Accent. Adorn your Galleon (or your Half-Galleon) with a Figurehead. Slay Blackbeard, Redbeard, or even the fearsome Nobeard, and take their stuff! Now enjoy this deluxe Guest Artist Edition, with standies and a game board! Tom Siddell is best known for his webcomic Gunnerkrigg Court, launched in 2005 and still going. He has also written stories for the Munchkin comic from BOOM! Studios. This is Siddell's first illustration project for Steve Jackson Games. Will you become the richest, most notorious merchant in Port Royal . . . or end up with an empty cargo hold? At last - the award-winning game of competing merchants is available in the U.S.! Players vie to hire the best Admirals, Sailors, Traders, and Mademoiselles to expand and fortify their vast shipping empires! You'll push your luck to amass the most wealth or to hire the best characters – but if you push it too far, you get nothing, so be wary. 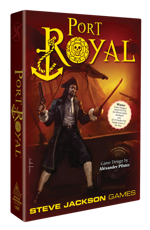 Gamers have loved Port Royal since the game's European release. It won the Wiener Spiele Akademie Game Designer Award for 2013, and in 2015, became the Vuoden Peli Family Game of the Year. Find all this and more this August at your friendly local game store!